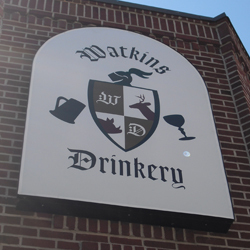 Watkins Drinkery is a cozy neighborhood bar located at 10th and Watkins Streets in South Philly. Open from 5 PM-2 AM seven days a week, we serve a diverse menu at reasonable prices (Kitchen is open till 1am every night!) with a beer selection to match. Check out our cask conditioned ales on the beer engine! Upstairs, you will find a game room with pool, darts, and some classic arcade games. Stop by sometime!